In the midst of the hot days the fields in this area just simple began to change colour and to this casual observer it would seem that they were simply drying-up. However, this crop just East of the Riverside gold course looks like it may still have some promise. The field looks to be only a week or so from harvest ready with only a few patches of green and the rest already in harvest gold. and the heads are also short. Looking across the rows above, you get an impression of a fairly good crop but in this picture (right) you can see that this is a pretty thin crop. But clearly good farming practices are paying off. 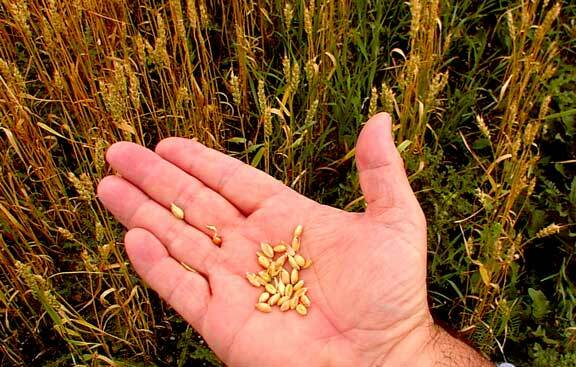 With perhaps as little as two inches of rainfall this is a harvestable wheat crop and the heads are full or filling with plump kernels that will harden as this crop matures. 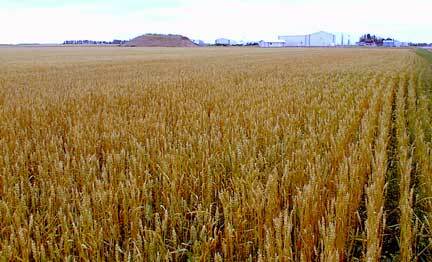 If other crops in the area are as good as this one 2002 is going to be an important year in grain production. 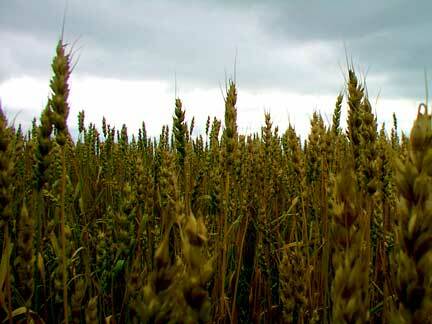 Not for large yields but for producing a crop at all in such adverse conditions.